You can choose among the tours that depart at 9am, 11:30am and, optionally, 3pm. 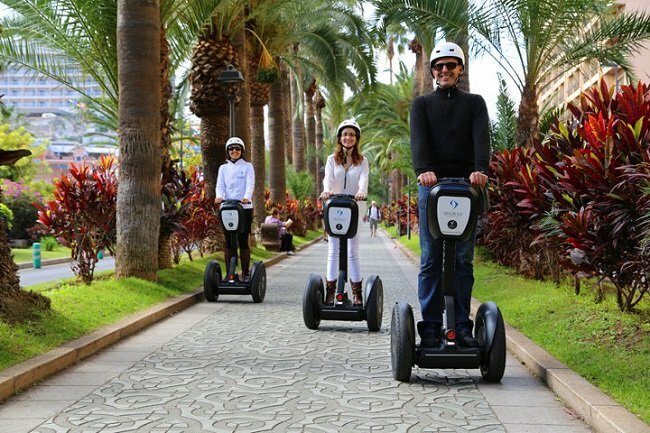 The Segway guided tour of Puerto de la Cruz takes place every week of the year during workdays. We are comparing Puerto de la Cruz Segway Tour Prices from leading ticket suppliers and Try to find you Cheap tickets prices on the market. The tour of Puerto de la Cruz by the Segway is a great overview of the city in North Tenerife that saves you time and energy. At the beginning of the tour, you will receive a training that will allow you to use the vehicle in an efficient manner. During the tour, the route leads you to points of interest such as beaches, monuments, landmarks, green oases and other noteworthy attractions. Some places located along the route are Garden Beach, the Saint Philip's Castle, the Church of Nuestra Senora de la Pena de Francia and Plaza del Charco. The Segway tour is available at different times of the day. The introductory tour of Puerto de la Cruz on Segway is a fun way of exploring the city and its top attractions. Hence, it is ideal for anyone who wishes to locate all top city's points of interest in a short time. Even if you were in the city earlier, this tour will probably reveal a lot of interesting facts you didn't know about. Your Experience With Puerto de la Cruz Segway Tour? On this Segway tour of Puerto de la Cruz, you will see top city's points of interest in a fun and efficient way. Along the way, you will pass by verdant gardens, interesting landmarks, historical monuments, attractive beaches and other noteworthy attractions. You will listen to an insightful narrative of a knowledgeable local guide who will convey to you everything you need to know. Benefit of a personalized guidance in a group limited to several people. What Puerto de la Cruz Segway Tour Includes? A short training session is available for you to get yourself familiarized with the vehicle and riding principles. A professional guide will provide training on riding a Segway and the insightful commentary of the city's attractions. In the case of rain, you will receive the raincoat. Mandatory helmet is a part of the equipment as well. Maximum of 6 participants takes part in the guided tour. The Segway tour is a highly efficient and convenient way of touring destinations you are interested in. A minimum height requirement prevents small children from riding the Segway. In general, the youngest age recommended for riding a Segway is 16. Travelers Reviews about Puerto de la Cruz Segway Tour? This entertaining and sightseeing activity has the 5 out of 5 rate on websites Get Your Guide, Viator and TripAdvisor. Every opinion about this guided tour hardly can be better. Tourists specify that the tour is informative, fun and well worth the related expense. The Segway Tour isn't suitable for people with physical disabilities. Electronic and printed vouchers are both valid and accepted for joining the Segway Tour of Puerto de la Cruz. You may redeem the entire amount you paid for the timely cancellations. The tour of Puerto de la Cruz in certain occasions may be carried out by an audio headset or multi-lingual guide. Pregnant women should avoid this type of activity. The same holds true for people that underwent some kind of surgery recently. If you have less than 45 kg or over 120 kg, you shouldn't ride a Segway. The departure point of the tour is San Felipe El Tejar Square, next to the Church of Los Dolores. Which is the Best Canary Island? Siam park or Aqualand - Which is Best? Duration: The sunset and stargazing experience lasts around 4 hours. Duration: The duration of these combined activities is around 9 hours. Duration: The duration of the tandem paraglide flight over the southern part of the island of Tenerife is between 20 and 30 minutes. Duration: You may choose how much time to spend in the Thermal Spa complex of Adeje. Duration: The informative guided tour of the island of Tenerife lasts around 8 hours. Duration: The day trip to El Hierro Island lasts around 12 hours. Duration: The duration of the Puerto de la Cruz experience is approximately 8 hours from the hotel pickup to the drop-off. You will have around 5:30 hours for the stay in the city. Duration: The duration of the visit to each of the participating parks is flexible and depends entirely on your wishes and needs. Duration: The combined kayaking and snorkeling activity lasts approximately 2 hours and 30 minutes. Duration: The duration of the medieval banquet and show with the closing entertaining performance is between 2 and 2:30 hours.